What makes ISO C++11 "feel like a new language"? 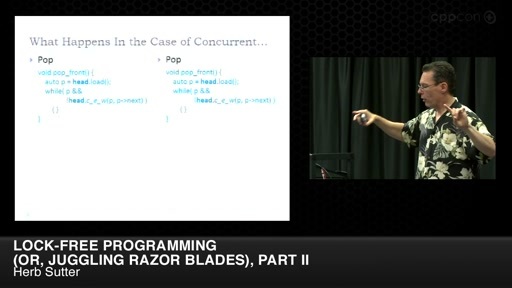 What things that we know about past C++ do we need to unlearn? 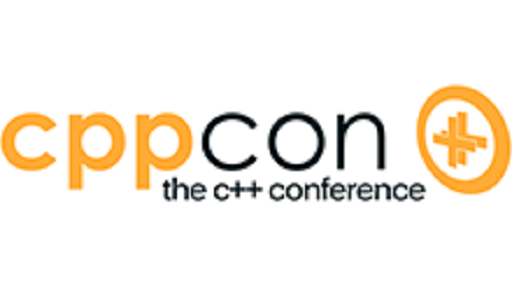 Why is C++ designed the way it is – historically, and in C++11? Finally, what is the difference between managed and native languages anyway, and when is each applicable? 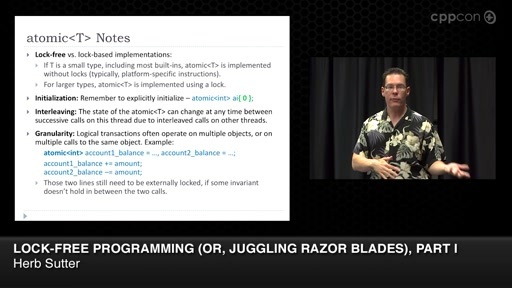 This talk gives an overview and motivation of modern C++ and why it's clean, safe, and fast – as clean to code in and as type-safe as any modern language, and more than ever the king of "fast." @Frank09125: Not a useless question at all. The title/abstract is in flight (this means, well, it hasn't landed yet. As soon as it becomes available, it will be posted here). All of these sessions will be recorded and made available on demand no later than a week after the event. Looking forward to this. It's Herb so you know it'll be cutting edge and based solidly in reality. Besides that I am not yet convinced that NET languages can't drive at the pace of C++. I blame the JIT compilers! Microsoft had a new one in queue, called "Phoenix". No word about it, sadly, in any recent events. NET does NOT need JIT compilers. Only very few application really need it and those who do can use a little runtime, compiling additional code when required. Reflection and dynamic invocation are no code generation features and can be implemented statically. Same goes for almost any other NET features, except code generation... Serialization also does not require dynamic code generation in theory. 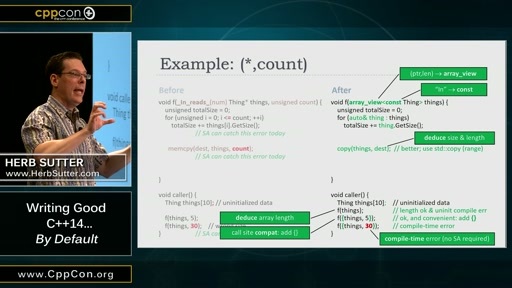 @Luna: Microsoft is still working on that AOT compiler for MSIL. @asker: Why do you write "back to topic" when you obviously haven't read any of the posts, judging by your question?! Awesome. 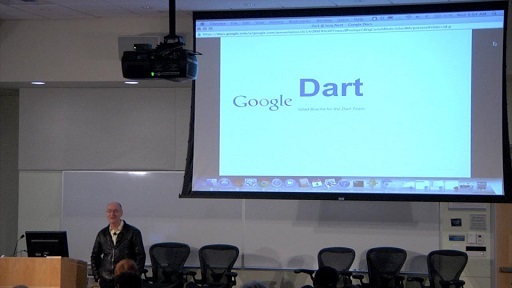 Thank you for posting this - this is the presentation I've been most keen to catch. 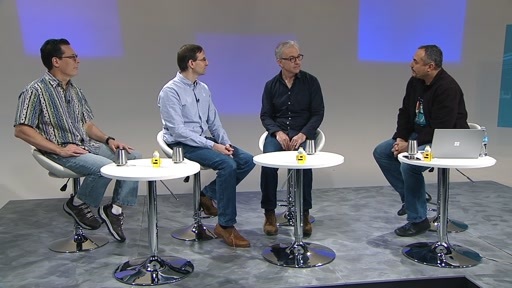 I'm very interested to hear what Microsoft is doing to help grow the surface area of Standard library over the next few years. Personally I like to see the C++ standards folks (including Microsoft) get into the habit of regularly publishing 'beta extensions' to the Standard library. If they're so tagged then we can treat them as such while still benefiting early and helping provide real world usage experience to shape them before their officially stamped as Standardised. Excellent talk! Thanks for this. If you use convenient classes like STL containers, smart pointers, etc. and modern C++ programming style, it is very difficult to have pointer dangling. Lots of problems and bugs with C++ and pointers are for old code bases, when C++ was used "like a better C", with raw pointers everywhere, no smart pointers, etc. But in more recent times the story changed. @C64: The big thing I personally got out of last week's event and chats was that Standard C++ now does have a safe subset, but we need a concrete description -- ideally a mode. It has made me think again about doing a scrub of all standard C++ language and library features and marking some as "unsafe" in some way (possibly that allows overloading, such as for vector::op overloads for safe and unsafe instead of the current hack of providing op and at() which almost nobody uses), then supporting a switch that enables only safe mode. I believe I know how to do that very efficiently now that we have C++11. I'll have to look into this more over the summer. I think saying "use this (possibly standardized) switch/mode and your modern C++ code is type- and memory-safe" would be a big deal and an important missing piece to completely answer and dispel this question. The question "what subset of C++ is that exactly and is it a usable subset" is a legitimate question now, and IMO wants a more concrete answer than we have today. I did look at this about four years ago, but we know more now, and (b) C++11 has already added most of the then-missing pieces now. @Luna:I think to save time would be to answer the question or not answer at all. wasting time would be to give a snide comment. @jamesfolk1: no because otherwise people will never learn... In fact they won't anyway but hope dies last! It has made me think again about doing a scrub of all standard C++ language and library features and marking some as "unsafe" in some way (possibly that allows overloading, such as for vector::op overloads for safe and unsafe instead of the current hack of providing op and at() which almost nobody uses), then supporting a switch that enables only safe mode. I believe I know how to do that very efficiently now that we have C++11. What about this idea. Have a separate namespace within or beside std, call it safestd. In there have safe substitutes for various functionality in the standard. Then you could choose between safe and efficient selectively with a typedef or a `using` statement. 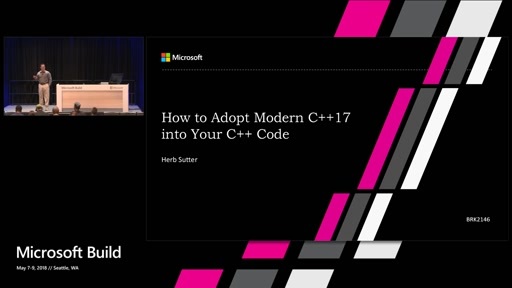 @hsutter I'm so excited to hear you talking about a possible await language feature for C++. And now I just read your comments about a possible safe mode, I'm running out of reasons to choose C# over C++ on many types of projects now. >I'm running out of reasons to choose C# over C++ on many types of projects now. First, it will take additional 5 years (at least) until this makes it into the standard and only god knows what happened to NET and C# by then... Also the NET class library is a little more extensive =). Second, the "safe" mode was my idea :D... I wanted to build it into Clang together with "pure". @bejamin: >Then you could choose between safe and efficient selectively with a typedef or a `using` statement. Very bad idea. Especially for templates this could be a hazard. But Herb already mentioned the good solution. Have "restrict()" do the work, just as it is for C++.AMP right now. @Luna: Could you please elaborate on why you believe it would be a hazard? Besides that I am not yet convinced that NET languages can't drive at the pace of C++. I blame the JIT compilers! It's usually the GC rather than the JIT compilers that cause the slow-down, although even that is pretty small now. Microsoft had a new one in queue, called "Phoenix". No word about it, sadly, in any recent events. C++ goes through Phoenix just like your C# does. Phoenix is a unification of all of Microsoft's compilers. It's there in VS2011. Mono and Java are already ahead performance wise. Can we get the slides from somewhere? > It's usually the GC rather than the JIT compilers that cause the slow-down, although even that is pretty small now. No its not. Quite the contrary. GC's can actually yield performance improvements over native code due to cache locality. The problem with most GCs is that they are not controllable, something that screams for a fix... I am not talking about the compiler itself, but the generated code. > Phoenix is a unification of all of Microsoft's compilers. It's there in VS2011. Just try it out... The only bottleneck of Java was the GC, which was noticably slower than NET, but maybe it is improved in Java 7. 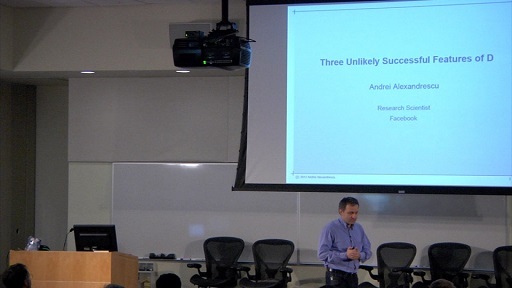 Quote (at around 1 minute and 20 seconds into the talk): "while still retaining 100% backward compatibility". So are there any studies that show that Java/C# actually give productivity gains over C++? And how much of the gain is simply due to the massive amount of wealth invested in their libraries? It seems Java and C# go out of their way to sabotage the RAII idiom and it seems like a big handicap for the programmer. If you are willing to sacrifice the user experience and performance and mobile battery life simply to reduce your labor costs, you must have few customers indeed. I propose you a challenge. Make a Matrix type (Generic, obviously. In the sense that Generic Programming means -maximal reusability, same performance-). Code it now in C++ (C++11, better). Next, compare the code and do performance benchmarks. @Fernando: No need, since I already know the answer. But the point I was trying to make is that there is no evidence that this gap could not be closed with good static compilers for those languages... But everybody talks as if it was hardwired or these languages were "born" to be slow. @Jonathan : I have put an entry in "UserVoice site for Visual C++" saying that the Debugger Canvas should be available for Visual C++ as well. I did that long ago. Nobody seems to be interested except me. Nobody has the time to look at these things and raise voice or let the Visaul C++ team know what you think is a valuable proposition to Visual C++. Everyone are confined to their little world and when a problem hits them, they come out yelling and blame everyone possible. @Luna: Do you know the answer? Which is it? I am with you, there is no evidence, ..., but there is no evidence of the opposite case. These other languages have some features (or lack of) in which they can not compete with C++. Some of them have impact on performance. On the other hand,I wouldn't think to code a simple web application in C++, where the main requirement is time-to-market (for now).